Location of the Eastern Scheldt. 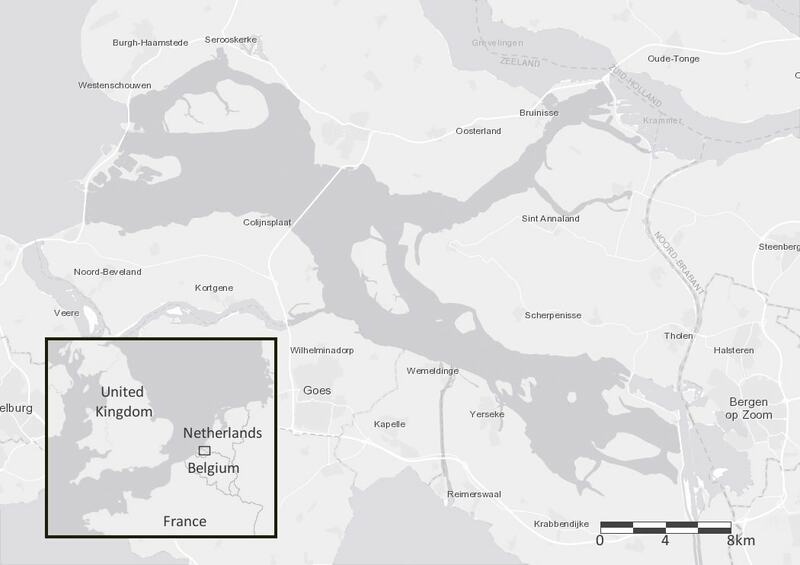 On the west side, the Eastern Scheldt is connected to the North Sea. 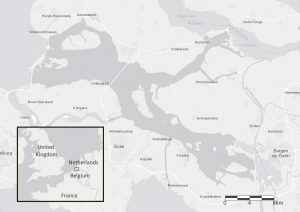 The Eastern Scheldt is a tidal bay, located in the southwestern part of the Netherlands. It is a National Park with a surface of 350 km2. From 1979 until 1986, the Storm Surge Barrier was built between the North Sea and the Eastern Scheldt. Both bodies of water are still connected through the open sluices. After a period when harbour porpoises were rarely seen along the Dutch shores, the number of porpoises in the southern North Sea started to increase in the mid-90s. Sightings of harbour porpoises within the Eastern Scheldt started to emerge around 2000 and increased in the years thereafter. This provides a unique opportunity to study these small cetaceans in the Eastern Scheldt. Researchers worldwide use photo-identification to study whales and dolphins. Photographs of unique characteristics allow researchers to recognise individuals between one sighting and the next, and monitor them over time. This can result in a lot of valuable information, such as movement patterns and social structures. Photo-identification is rarely used to study porpoises, although it is possible. Individual harbour porpoises can be recognised by their pigmentation pattern, the shape of their dorsal fin, scars, and nicks on their dorsal fin and peduncle. However, it should be taken into account that scars and nicks can be obtained over the years, and that scars can fade away over time. After some years of opportunistic data collection, Rugvin Foundation implemented dedicated photo-identification research in the Eastern Scheldt since 2015. 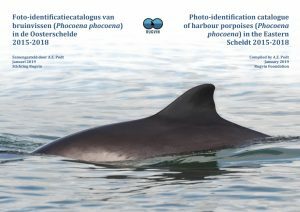 Rugvin Foundation released the first catalogue of harbour porpoises in January 2019 as a result of this research. All harbour porpoises within this catalogue have been observed and photographed at least once between 2015-2018. On each occasion efforts were made to clearly photograph both sides of the porpoise. Each individual received an unique identification number for the left and right side. Sometimes, the match between both sides is not yet known. Each individual’s profile includes the years in which observations with photos have been registered (including 2009-2014). If an adult was seen in close association with a calf, it was classified as a (likely) female. Our photo-identification study has shown that many individual harbour porpoises have been present in the Eastern Scheldt for a number of years and are clearly resident in this area. This research was made possible with the help of many volunteers and with the support of the Dutch World Wildlife Fund.